Deadpool is oddly paranoid, feeling like he’s being followed by “The Butler.” So what does he do? 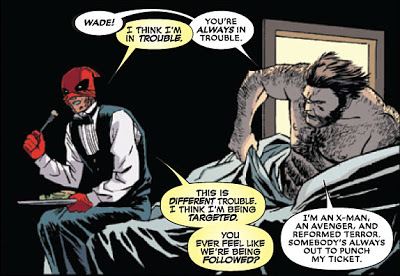 Puts on a butler’s uniform, makes some Downton Abbey jokes, and serves Wolver‌ine breakfast in bed. We find out that the Butler is a real threat. He’s hired a team to track down Deadpool and drop him off at a lab where he plans to use Deadpool’s healing factor to heal a loved one’s cancer. This is a Deadpool worth reading, but I say that about all of them. I don’t want to give too much away because this one has a big twist at the end. Read it for yourself! Next Next post: Ben Affleck Is Batman?